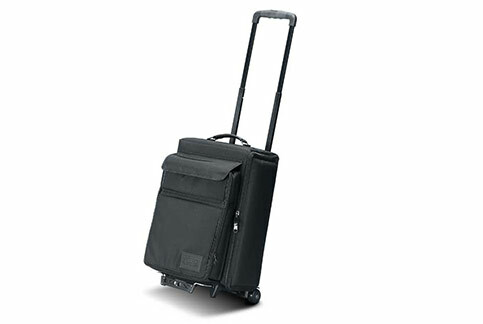 Carry-on wheeled bag for the projector with removable computer case for laptops up to 14.5 x 11.75 x 2 inches. Inside accessory area for cords, cables etc. Comfort grip extension handle locks at 36 in. and 43 in. Ball-bearing skate wheels for travel convenience. Black Dupont Original Ballistic nylon fabric for durability and moisture resistance. Firm industrial grade foam and rigid ABS plastic interior for added protection. Extension platform for stability and extra items that may need to be carried.